Program Error Monitor allows developers to be immediately aware of malfunctions occurring in their programs and provides them with the documentation needed to understand the cases and to start providing fixes. Note- This support is available only for ILE-RPG programs. The following data base file must be populated with local information. Use STRDFU option 5 (Update data using temporary program) to maintain data. Note 1- You can enter multiple records (multiple developers) for a given application program library. Note 2- You do not have to specify all the application program libraries. You may enter *ALL (uppercase, please!) as an application program library name. When a program error occurs for a program belonging to a library not documented in this list, it will default to application library name *ALL. Note 3- You can enter multiple records (multiple developers) also for application program library *ALL. See figure 2 as an example. These statements generate a Program Error Subroutine (*PSSR), which receives control in case of program error. See later for the behavior of this subroutine. The following is about the E-Police program error subroutine *PSSR that you may add (see above) to your ILE-RPG programs. This is just for your information, no action from your side is required. if the program is running in batch mode, a break message is sent to the job user profile message queue (see figure 5) and a program message is sent to the *EXT message queue (so that it is displayed in the joblog). An e-mail message is sent to the program developer(s), according to the data found in file EPOLICEDTA/LIBRARIES. See the example in figure 6.
the program source (see figure 8). 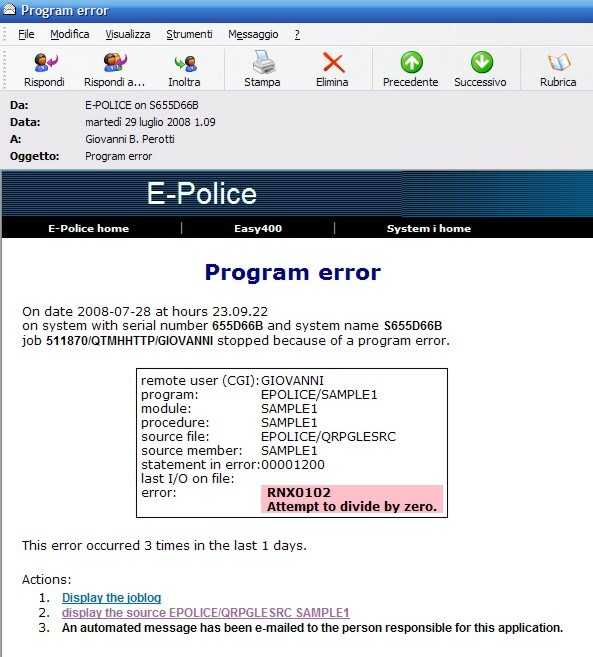 or program EPOLICE/SAMPLE2 (see figure 9). You may run them in interactive mode, in batch mode and even under HTTP (e.g. http://.../epolicep/sample1.pgm ). Note- Program SAMPLE1 tries to divide by zero, while SAMPLE2 tries to write a duplicate key record to a database file. 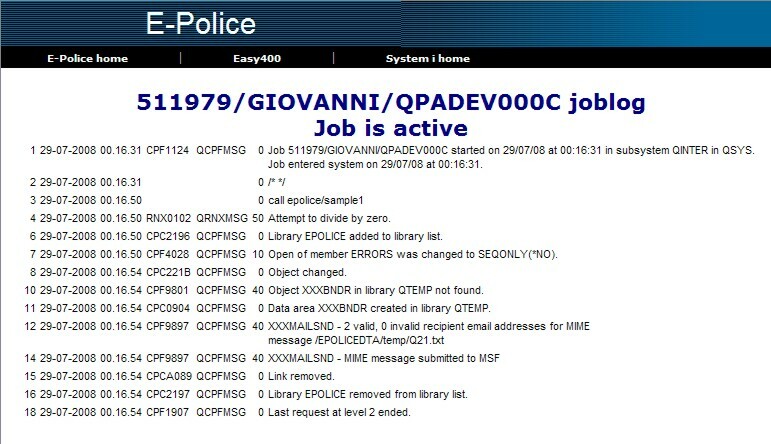 Command EPOLICE/RCVJL (receive joblog) receives the joblog entries of an active job into file QTEMP/JLOG (which is automatically created). It could be useful for other local applications.